Heavier than air aircraft traveling through the atmosphere and referencing Keely's experiments in levitation and his air-ship. To religion the cause, to science the method; to religion the power, to science the path. - B. P. Bowne. "I believe that the dawn is fast approaching when all scepticism will be wiped from off the face of the earth, and true science will become the religion of the world." - John Ernst Worrell Keely. "The fathers stone them and the children build them monuments. " - It is the history of all spiritual and scientific progress. - Dr. J. M. Storrar. And day was yet unborn! - H. M. Ratcliff. PRIESTLEY, who believed that all discoveries are made by chance, compares the student of nature to a hound wildly running after and here and there overtaking game; but "Providence sends chance, and genius moulds it to its own design." Edison well explained the difference between discovery and invention when he said that in discovery there must be an element of the accidental, and an important one, too; while invention is purely deductive. The story of the apple dropping from the tree and Newton starting with a species of Eureka he rejects absolutely. Maintaining that an abstract idea or a natural law may in one sense be invented, he gives it as his opinion that Newton did not discover the theory of gravitation but invented it; that he may have been at work on the problem for years, inventing theory after theory to which he found it impossible to shape his facts. This is precisely what Keely has been doing in the construction of his system of sympathetic physics; so adverse is it in all its canons to those of mechanical physics. He has been unraveling the mysteries of sympathetic association, while searching to wrest from nature the secrets of planetary suspension, and what Norman Lockyer calls "the law of sympathetic vibration." Edison does not call himself a discoverer. He says that most of his inventions have been the result of long and patient labor, of countless experiments all directed toward some well defined object; and the same may be said of Keely in his inventions, for he is both a discoverer and an inventor. Experimenting in the field of vibration, but in quite another line than that of sympathetic vibration, he made his discovery of an unknown energy. Bell filed the telephone as an invention before he had discovered that articulate speech could be conveyed along a wire. Reaching out into unknown realms, on the line of invention, he laid hold of a discovery when speculating on the nature of sound. In the same manner Keely's speculations, in the field of acoustics, led him into that great unknown tract which lies beyond the horizon of ordinary matter. 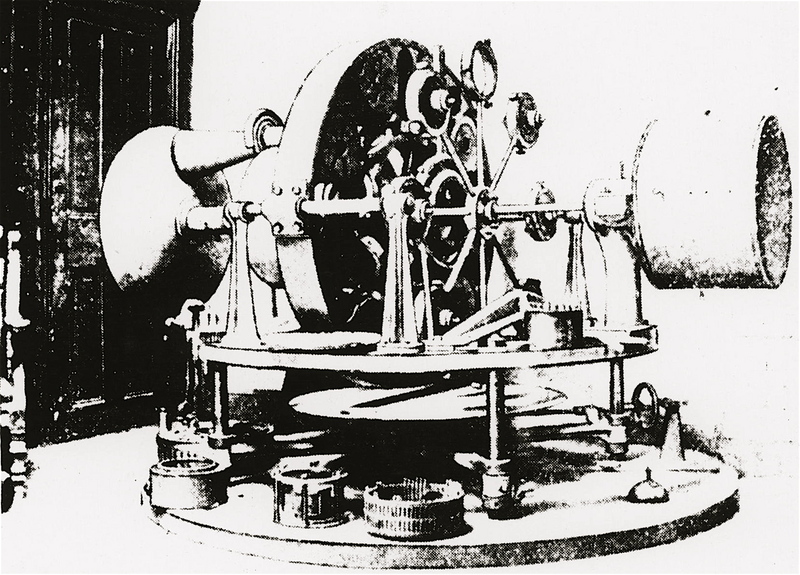 It was in subjecting water to the action of multiple vibrations in a machine which he called a hydro-pneumatic-pulsating-vacuo engine that his lever suddenly registered a pressure of two thousand pounds. It was six years later that experimental research, on the line of vibration, enabled Keely to produce this manipulation of energy at will; for he had no idea at what number of vibrations the water had been disintegrated. Commencing with one hundred per second he proceeded until his instrument registered forty-two thousand eight hundred, when the same pressure was again shown, and the problem was solved. It was about this time that some distinguished men of science, who were called in to account for the phenomenon, found it easier to denounce Keely as a charlatan than to explain the nature and source of the energy; one of these men has recently said that he thought a man who could produce a registered pressure of from two to twenty thousand pounds and profess to be ignorant of its source must be a fraud. Deserted and stigmatized by physicists, Keely's only hope in the line of utilizing this unknown energy lay in those men who had in 1872 organized a Keely Motor Company in order to furnish the "sinews of war" that could enable him to battle with and conquer the invisible genii he had imprisoned by seeming chance in his vacuo-engine, and which had already reduced his funds to "vacuo. " That Keely would eventually gain the mastery of this vapor, no one had a shadow of doubt who knew the indomitable will, energy and persistency of purpose possessed by its discoverer, combined with his inventive genius, as made known in the novel construction of the engine which gave birth to the vapor that they then named Keil. Yet so sanguine were these men of immediate success that they made promises, based on the always sanguine hopes of an inventor, which Keely was unable to fulfill; with the consequence that the Keely Motor enterprise came to be regarded as a fraudulent undertaking, Keely himself as a swindler, and his adherents either disreputable gamblers in stock or the dupes of his wizard artifices. At this juncture one of his ci-devant managers, John H Lorimer, and one of his stockholders, Oliver M. Babcock, came forward with attempts to remove from Keely's shoulders the load of obloquy which, joined to the total cutting off of the funds needed to pursue his researches, had so depreciated his vitality as to lead him to contemplate suicide and to destroy devices for research which had been the labor of years. Together these two loyal, steadfast friends lifted the veil of mystery which had gathered around Keely's work, and one by a minority report and the other by a series of lectures made it perfectly clear and without a shadow of doubt that certain of the company's directors were responsible for the existing state of affairs. About this time, a small pamphlet written by Mr. Babcock, "Fraud, Force, Facts," fell into the hands of H. 0. Ward, who, convinced thereby of the integrity of Keely and of the unscrupulous greediness of some of the directors or managers of the company, came to the rescue with the required funds for the continuance of researches; and Keely, thus encouraged, pursued his work with renewed enthusiasm. Of that winter, 1881-82, he always speaks as the darkest period of his life. To this trinity of united effort in behalf of truth and justice, drawn together by an overruling Providence, the stockholders of the Keely Motor Company owe whatever commercial success the enterprise may bring to them in the future. To the world at large it does not matter whether this century or the next sees the viewless pathways of the air opened to navigation, so long as it is authoritatively announced that the conjectures of the late Prof. Joseph Leidy and of Dr. James M. Willcox, made in 1889, that Keely was on the road to the solving of this problem, are now verified by his success as well-founded conjectures. This system is the only one by which aerial navigation can be rendered safe; for it is in copying nature's methods that the overcoming of gravity has been gained, and the operating principle is the same that guides and controls the heavenly bodies in their orbits and underlies planetary suspension. The system of this "Newton of the mind" demonstrates, on the material plane, the superiority of the spiritual or ethereal powers; and the unity of nature, of science and philosophy becomes evident. "Its broad and reaching philosophy," to quote the opinion of Professor Dewar, "has a physical genesis, and is the result of the patient and persistent researches of years." But we are not dealing now with the philosophy, rather with the events which gave birth to it; for up to this time Keely had devoted more thought to engines than to systems. Mr. Babcock's lectures supply the material for the remaining pages of this paper. It is not deemed expedient to wait until public demonstrations made by Mr. Keely have extorted recognition from scientists, for there would then be no need of any written defence, and it would also be difficult to command proper attention to the principal facts. It is not enough that the enthusiasm which would be aroused over the triumph of Mr. Keely would cause the charges made against his integrity to be disregarded. They must be rendered unworthy of credence by a thorough exposure of the facts, before opinions have settled into convictions and grown into prejudices, which are always difficult to overcome. During more than five years of unprovoked abuse Mr. Keely has never prompted an action in his own defence, by publication or otherwise. With a patience which evidences the most exalted dignity, his course has been a crucial test of that immortal proverb enunciated by Washington, "To persevere in one's duty and be silent is the best answer to calumny.'' While no motive can be assigned for these public assaults, it is noticeable that they have chiefly sprung from sources professedly scientific and consequently have widely influenced public opinion. The universal feeling that Mr. Keely has been an unnecessarily long time in bringing out his motor is in part due to the publicity given to his discovery, before he had even attempted to apply it to mechanics; and was the outcome of the speculative ambition of those who planned the organization, coupled with the mistakes natural to all enterprises under the control of inexperienced managers. Mr. Babcock asserts that Mr. Keely did not retain one-fiftieth of the amount of the stock issued representing three of his projected inventions; that not less than half a dozen speculators, in the stock of the company, have each made an average of more than fifty thousand dollars from the enterprise; that high salaries and other profligate ways of distributing the money diverted it from its proper channel, depleted the treasury, detained the progress of the work and disappointed the stockholders. From the time of the organization of the company, its active financiers have appeared to estimate the value of the motor by its availability as a means to personal ends; regardless of its ultimate success as a public benefit or as an achievement in the advance of true science. Their aims are so far below the aims of the discoverer and inventor that his efforts overshoot their actions; and before their motives and intentions are discovered by him he is undermined, so that only by enormous sacrifices is he able to recover himself. When the company's interests are trifled with by its trustees, when its officers conduct its affairs as if its only worth is that of temporary speculation, how can it be expected that those who have no other criterion by which to judge will feel any confidence whatever in the enterprise? By Mr. Keely's own imprudence and the advantage taken of it by others, the costs, as well as the labor imposed upon Mr. Keely, have been enormously increased. Mr. Keely cares for nothing but success, regardless of pecuniary benefit to himself. He has often submitted to the most extortionate terms proposed to him when promised funds, that were overdue, were not forthcoming; for with him any sacrifice that he could make was preferable to loss of time. A man of great physical strength, a hard worker with hands and brain, he is still more remarkable for his energy and persistency of purpose. He is a close observer, a liberal thinker and a bold experimenter. He has suffered from severe physical injuries and hand many narrow escapes in his experimental researches; as bodily scars, mutilated walls and ceilings, with heaps of metal tubes burst asunder, can testify. His mind at a tension under pressure of high resolves, hampered and hindered, and time thrown away in giving exhibitions, the wonder is that he has accomplished so much in so short a time, considering the prodigious amount of dead-work that had to be done before reaching the present stage of achievement. Samuel Finley Breese Morse was twelve years in attaining the results which proved the success of his system of telegraphy, and he was only adapting a well-known agent to a new use. Keely discovers an unknown agent, and labors to invent means to apply it to many uses. Where others have used only pounds of metal in experimental research, he has used tons in his efforts to construct an engine, for the Keely Motor Company, before he knew the origin or the nature of the energy he was dealing with. He had to work with great caution while handling a power infinitely greater than that of gunpowder, and of unknown extent and character. His temporary safeguards and devices, for finding out the qualities of this force, are all of his own invention. Many cartloads of these have been sold from time to time as old iron, brass and copper. One apparatus thus disposed of weighed twenty-two tons. In this way, and by pawning his watch and other valuables, has he raised money when a little was absolutely necessary; and at one time he sold his costly scientific instruments, including a valuable microscope, with other effects, in order to pay mechanics and buy material rather than allow the work to stop. He has toiled through periods of almost destitution, while the press, religious, secular and scientific, was representing that he was fraudulently amassing wealth. Comparing it with steam it is as different in action as it is opposite in origin. Steam is derived from heat or combustion, and so may be said to have a chemical origin; the vapor is a production of mechanical action, a spontaneous energy. Vibration, whether considered as an energy or a motion, is an inherent property or concomitant of matter, and therefore spontaneous. Keely's inventions for producing this power are so entirely original, and so unlike any other devices that have been constructed, that there is nothing in the annals of research to afford a starting point for the understanding. The mechanical means by which this occult energy under consideration is educed and economized, are as unique as those which belong to electricity. Keely's instruments are no more like electrical apparatus than they are like the machinery used with steam, the product of the crude molecular dissociation of water by heat. Mr. Babcock's resume of the situation, made in 1881, is no longer complete; such great and un-dreamed-of advances has Keely effected since that time in the unexplored territory that lay before him, wherein he had not then gained even so much as a foothold; for he was too near '"the shadow realm" in which those physicists are now groping, who have passed from the investigation of ordinary, visible matter into that of the structure of the ether. Two years later, in 1884, Keely discovered that the occult vapor which he had imprisoned is the ether; and for four years he bent all his energies upon the construction of an engine that would hold it in rotation; for so only could it be "used and controlled, as we now use and control steam," to quote Professor Rucker's surmise, made in his paper read before the meeting of the British Association at Cardiff seven years later, in October, 1891. In 1888, Keely made a verbal contract with H. O. Ward, to do no more work on an engine, for the Keely Motor Company, until he knew more of the properties of the ether, and in 1889 this contract was legally executed. It was during this period that Keely discovered that the ether is not the energy itself, but the medium of one of the currents of a triune polar flow, of which he had now gained the control, for aerial navigation, hooking his machinery on to the machinery of nature, to quote Tesla's words. Ten years before, with his far-seeing mental vision, Mr. Babcock predicted this result; and if the control of the affairs of the Keely Motor Company had then been shaped by Mr. Lorimer and himself, years of delay might, under their united efforts, have effected results that now seem, to those who believe in an over-ruling Providence, to have been brought about by accident. It was at this time, and in one of Mr. Babcock's papers, that he wrote of Keely's line of research as lying beyond the scintillating horizon of molecular physics; in the open field of elemental force, where gravity, cohesion, inertia and momentum are disturbed in their haunts and diverted to use; where, from unity of origin emanates infinite energy, in diversified forms; which, with manifold expression, is ever ready to respond to the invocations of genius. ... The principle of this energy is vastly more comprehensive than any now in use; as limitless as that of the lever; as universal in application, reaching to so many results not yet attained, that forethought is inadequate to grasp its possibilities for power, prosperity, and for the maintenance of peace between nations. It may be added to these powerful words that its possibilities are equally great for the solving of the problems of our age, as mighty as the one which lies at its heart, viz., how best to reconcile the seemingly conflicting interests of capital and labor. "All that relates mechanically to travel, transportation, manufacture, mining, engineering and warfare is included in this iconoclastic force," and with all these a sweeping and overturning change in the accepted canons of pseudo science. Only a little reflection is needed to see, in the signs of the times, a tendency to movements on a grander scale; such as are involved in the questions of the day discussed in the writings of men and women of culture. Physical investigation will be stimulated by the unfolding of Keely's system of philosophy, as well as by the demonstrations that he will be able to give, when his mechanical work is done, of the existence of "mind flow." Physicists will then no longer shrink from investigations on this line, in fear of the ridicule which orthodox science deals with no unsparing hand upon the vanguard that has approached the borderland of its mysteries. As has already been shown, when Mr. Babcock delivered his lectures both Keely and himself believed it to be possible to use and control the vaporous product of the dissociation of the elements of water in his disintegrator, but Keely found it impossible to test its nature in any way. As long as it was kept in rotation energy was manifested. All his devices to hold it, in this rotating condition, failed to operate beyond a limited time; and to "stop the leak " was equally impossible. Nothing was left but atmospheric air, after its escape from the engine. There was also something so mysterious, so occult, in its operation as to lead Keely, in 1882, to try to construct an automatic device, by the use of which each man could effect its control, according to the degree of his energy of will. Taking up a new standard of research, Keely pursued it by day and night, often working eighteen hours out of the twenty-four, until the subtle etheric vapor, which had eluded his every effort to continue within walls of metal, and baffled his every attempt to control, was revealed to him as the medium of nature's most powerful agent, the triune polar flow, which he has now harnessed for navigating the air. Sir John Herschel said; "There is a principle in music which has yet to be discovered. " This is the principle which Keely has laid hold of and utilized, after more than twenty years of effort to wrest it from the great storehouse of nature's secrets - thus fulfilling Kepler's prophecy, that God would reveal to this age the mysteries attendant upon the operation of gravity; and proving that the Pythagorean conception of music as the principle of the creation's order, and the mainstay and supporter of the material world, is strictly in accordance with the marvelous truths revealed in Keely's system of sympathetic vibratory physics. When Huntington wrote, "A mysterious force exists in the vibrations of the ether called sound, which science and invention have so far failed to utilize; but which no doubt in the near future will come under man's control for driving the wheels of industry," he was a true prophet; and the wonder is that, with so many intimations by others of its importance, so few have been interested in Keely's experiments in the realm of acoustics; and so many ready to jeer at "the zither and the horn, the fiddle and the bow," used in his researches. True, when the zither was held up as the source of the mysterious force, and the horn as its reservoir, as they were of late, while perpetual motion was discoursed of as if it were a principle of nature that Keely was copying, one could not expect anything but the ridicule and criticism that followed in our daily journals, from Maine to California. Prof. George Frazer Fitzgerald, physicist at Trinity College Dublin, has said since that Keely had nothing more to sell at the time than Sir Isaac Newton had when he discovered gravity.